We specialize in custom orders and have accounts with all major brands in the industry. Whether it's a corporate event or your personal use, we can create the perfect gift for you and your clients. We offer a wide array of golf brands including: Peter Millar, FootJoy, Johnnie-O, Titleist, Vineyard Vines, Travis Mathews and Ecco shoes. 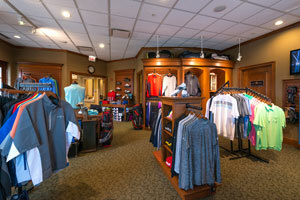 Please contact The Golf Shop at 847-832-6450 for more information. Dress Code: The dress code for the driving range and the couse is a shirt with a collar and dress slacks or shorts. No denim, sweatpants, or athletic wear please.